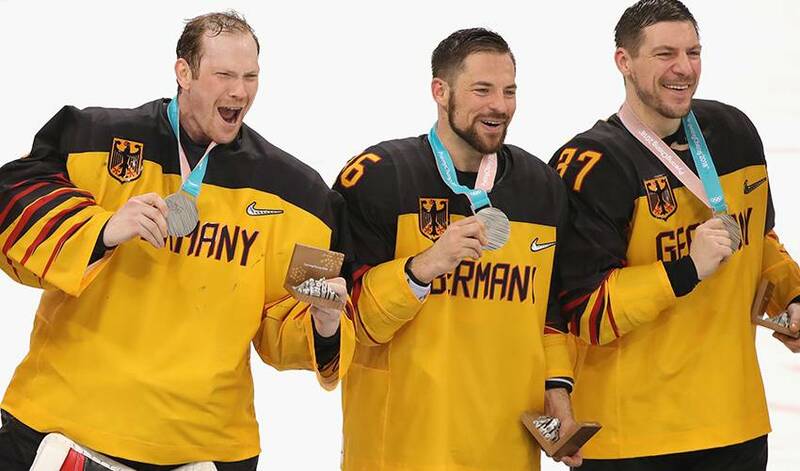 Even though Dennis Seidenberg was 14 hours away and halfway around the world, he went along for the ride when his fellow countrymen from Germany shocked the hockey community to claim a silver medal at the Olympics two weeks ago. Seidenberg and his younger brother, Yannic, a defenceman for the PyeongChang 2018 German Olympic team, are extremely close. The two face-timed each other following practices and games. Yannic sent photos of team celebrations in the dressing room and what the German players did in their spare time at the Athletes' Village and during their Olympic experience in PyeongChang, South Korea. "It was so much fun to watch those celebrations," said the 36-year-old New York Islanders defenceman, referring to Germany's upset victories over Sweden and Canada in the quarterfinals and semifinals, respectively. The Germans lost 4-3 in overtime to the Olympic Athletes from Russia. Dennis played on the German national team that lost in the quarterfinals 5-0 to the United States at Salt Lake City 2002, finished 10th out of 12 teams at Torino 2006 and 11th out of 12 teams at Vancouver 2010. "We didn't even qualify for the last Olympic Games [Sochi 2014]," said the older Seidenberg, who also represented Germany at the 2001, 2002 and 2008 World championships as well as the 2004 World Cup of Hockey and for Team Europe at the World Cup of Hockey 2016. "I can only imagine what this will do for hockey back in Germany," Seidenberg continued. "I'm sure there were a lot of kids watching what went on. Hopefully, some of them will want to play hockey now. It's all soccer back home, but hopefully, this result will kickstart hockey for some kids in Germany." The older Seidenberg has done his part. He followed his childhood hero Uwe Krupp to the NHL 16 years ago with the Philadelphia Flyers. Krupp, whose 27-year-old son Bjorn also played for Germany in PyeongChang, was the first German-born and trained player to win the Stanley Cup in 1996 with the Colorado Avalanche, did so again six years later with the Detroit Red Wings. Seidenberg followed suit with a Stanley Cup win of his own with the Boston Bruins in 2011. Yannic was in Vancouver when the Bruins won the seventh and deciding game against the Canucks and took a picture with his brother and the Stanley Cup on the ice during the championship celebration. The 34-year-old Yannic never performed in the NHL. But he did play junior in Canada for the 2003-04 Medicine Hat Tigers and helped the Tigers win a Western Hockey League championship. Willie Desjardins was the Tigers head coach back then and also was Canada's head coach at the Olympics last month. Yannic's career was hindered by seven knee surgeries and he converted from left wing to defence a few years ago. He and Dennis get together at the latter's New York-area home for a month of summertime training sessions. "We each have three kids," Dennis said. "So the house is packed. It's a zoo. But it's a lot of fun. We get to work out together and enjoy challenging each other." The older Seidenberg never considered taking a year off from the NHL to play for Germany at the Winter Games. "No, I'm an NHLer," he said. The performance of his countrymen made him proud. He was especially happy for his brother and former San Jose Sharks forward Marcel Goc. The three were teammates with the Mannheim Eagles during the 2012-13 lockout. Seidenberg also was pleased for his former Bruins teammate, Marco Sturm, the 39-year-old German head coach. "I'm really happy for Marco," Seidenberg said. "I played with him in Boston and I played with him at the Vancouver Olympics. In a relatively young coaching career, he's accomplished a lot. But I'm happy for all of them. I played with a lot of those guys growing up."